First, wash all types of fruits, and cut square shapes in a bowl, mango, apples, grapes, almonds and strawberries. And add the yogurt, mint leaves and paste, lemon juice and sugar mixed as well. 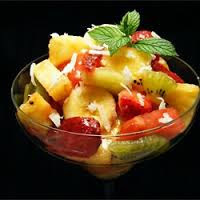 The containers are then poured into a mixture of pineapple, palm and pomegranate served with banana. When ready mix well , then serve please dish any decorated plate. So so delicious and yummy.